For the artists who covered "Rockin' Around the Christmas Tree" as "Mel and Kim", see Mel Smith and Kim Wilde. Mel and Kim were a British pop duo, consisting of sisters Melanie and Kim Appleby. Originally managed by Alan Whitehead, they achieved success between 1986 and 1988, before Melanie, who had been diagnosed with cancer, died in January 1990 at the age of 23. The duo reached number one in the UK Singles Chart with their 1987 single "Respectable", which also topped the US dance chart. They had three other UK Top 10 hits with "Showing Out (Get Fresh at the Weekend)" (1986), "F.L.M." (1987) and "That's the Way It Is" (1988). In 1988, they were nominated for a Brit Award for Best British Breakthrough Act. After Mel's death, Kim embarked on a solo career and had two UK Top 10 hits with "Don't Worry" (1990) and "G.L.A.D." (1991). Mel & Kim were born to British and Jamaican parents. In 1985, Mel recorded two demos solo, under Alan Whitehead's management. Soon after, her sister Kim joined her and they performed as a duo, recording some demos. The demos got them signed with Supreme Records, and Nick East - president of Supreme - put them in touch with producers Stock Aitken Waterman. "System" was intended as their first single, but they and the producers were unhappy with it, and it became the "B-side" of their first release "Showing Out (Get Fresh at the Weekend)", which reached number three on the British charts in 1986. It was a minor hit in America peaking at #78, but did peak at #1 on the Dance Chart there. Their next single "Respectable" reached number one in Britain. They became well-known celebrities in Europe, particularly in Britain, and were known for their visual style which combined urban street wear with high fashion (prior to their music career Mel had worked as a glamour model). Their third single "F.L.M." reached number seven in the UK, while their final single "That's the Way It Is" reached number ten, giving them an unbroken run of top ten hits in the UK. In February 1988, they were nominated for Best British Breakthrough Act at the Brit Awards, losing out to Wet Wet Wet. In December 1985, prior to the duo's success, Mel was treated for malignant paraganglioma, a form of cancer, on her liver. By January 1987, Mel was experiencing back problems, delaying the filming of the "Respectable" music video. During a promotional visit to Japan in June 1987, the severity of Mel's back problem became apparent. Upon returning to the UK, she was diagnosed with a recurrence of the cancer in her spine. The sisters withdrew from publicity while Mel underwent treatment, and footage from their Montreux Festival performance was used to compile the "F.L.M." music video. While the media speculated that Mel was terminally ill, both sisters categorically denied this, stating that Mel had suffered a debilitating back injury. Eventually, it was confirmed that Mel had been diagnosed with cancer, following the release of "That's the Way it Is" in February 1988. Mel discharged herself from hospital to record the vocals for the track. Work on a second album was not continued, due to Mel's illness. Both sisters appeared on the Wogan show in April 1988 while Mel was still undergoing treatment, as part of European Cancer Week. On 18 January 1990, Mel died suddenly of pneumonia after contracting a cold. The chemotherapy had significantly weakened her immune system. In January 2018, the release of a previously-unreleased unfinished demo track, "Where Is Love", was announced on the official Mel & Kim website. It is scheduled for a February 2018 release. With the aid of her then boyfriend, ex-Bros bassist Craig Logan, Kim launched a solo career with much of her debut solo album composed of songs co-written with Mel, for what was intended to be the next "Mel and Kim" album. The album, Kim Appleby, contained her debut solo single "Don't Worry", which reached number two on the British charts in November 1990. A follow-up single "G.L.A.D" was also a UK Top 10 hit. Subsequent singles from her debut album were "Mama" [#19] and "If You Cared" [#44]. Kim's second album Breakaway was not a commercial success and had a limited release. She released three further singles, "Light of the World" [#41, 1993], "Breakaway" [#56, 1993], and "Free Spirit" [#51, 1994]. A download-only single called "High" was released in 2007. In 2010 a 2 CD Deluxe Edition of F.L.M. was released which included extended Bonus tracks as well as the single That's The Way It Is and various remixes of the original hits. 1988 "I'm the One Who Really Loves You"
1989 "More Than Words Can Say"
^ a b c d e "Official Charts > Mel and Kim". The Official UK Charts Company. Retrieved 2 April 2016. ^ a b "Mel & Kim Chart History > Dance Club Songs". Billboard. Retrieved 3 March 2019. 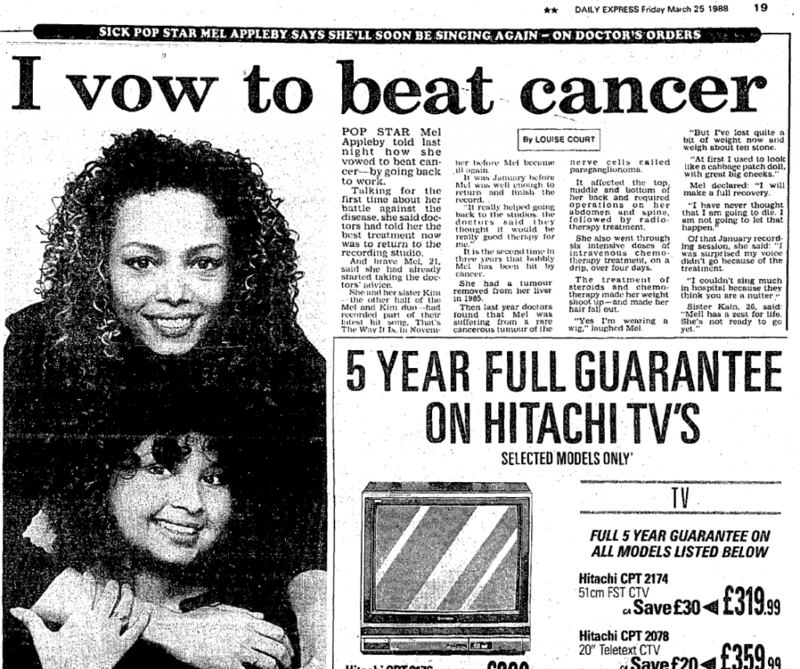 ^ "Daily Express 25th Mar 1988 > I Vow to Beat Cancer". Imgur.com. Retrieved 6 January 2018. ^ a b "Kim Appleby from Mel & Kim interview on Trisha Goddard 26/8/2005". YouTube. Retrieved 6 January 2018. 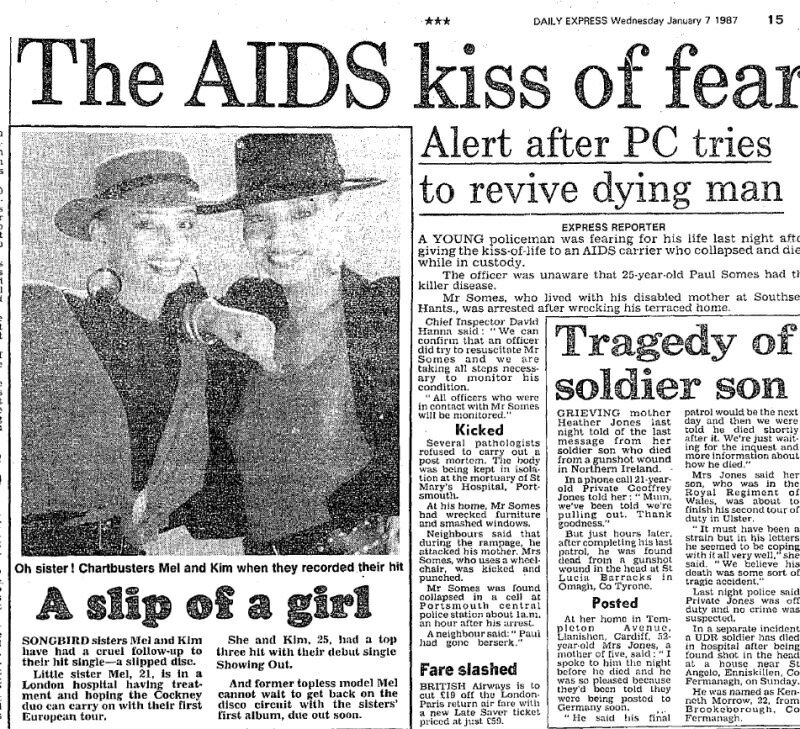 ^ "Daily Express 7th Jan 1987 > A Slip of a Girl". Imgur.com. Retrieved 6 January 2018. 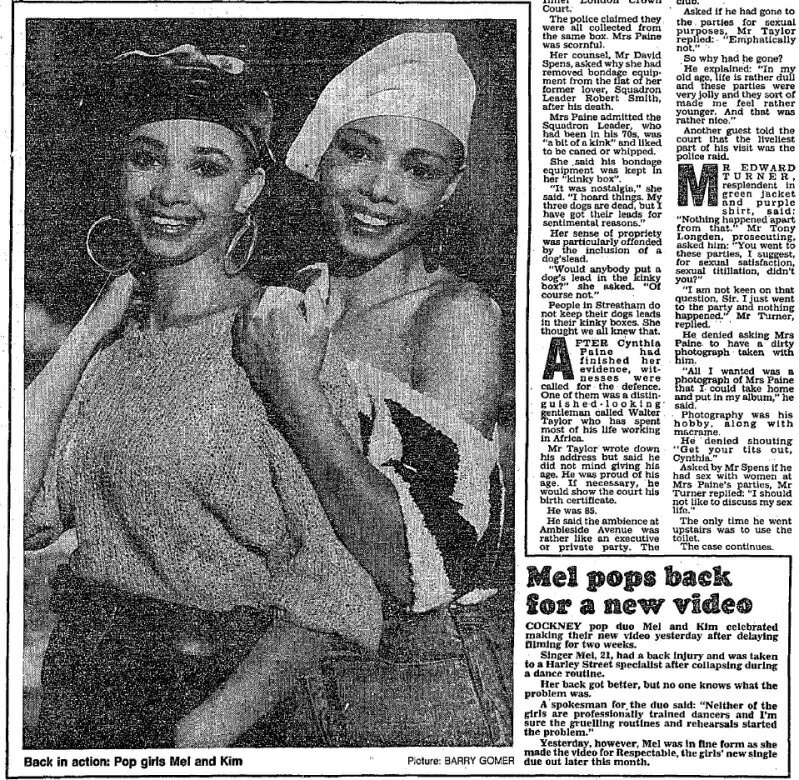 ^ "Daily Express 6th Feb 1987 > Mel Pops Back for a New Video". Imgur.com. Retrieved 6 January 2018. ^ www.pwl-empire.com. "Pete Waterman Entertainment Ltd - Q & A about PWE artists (archived copy)". www.pwl-empire.com. Archived from the original on 25 October 2008. Retrieved 15 September 2015. ^ "'Where Is Love' – The Fifth Official Mel & Kim Single. (from melandkim.com)". Imgur.com. Retrieved 6 January 2018. Kent, David (1993). Australian Chart Book 1970–1992 (Illustrated ed.). St. Ives, N.S.W. : Australian Chart Book. p. 197. ISBN 0-646-11917-6. N.B. 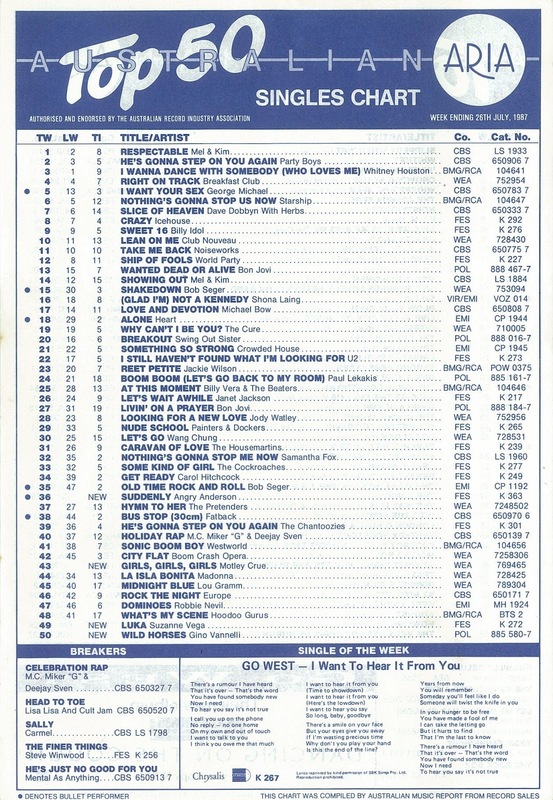 the Kent Report chart was licensed by ARIA between mid-1983 and 12 June 1988. 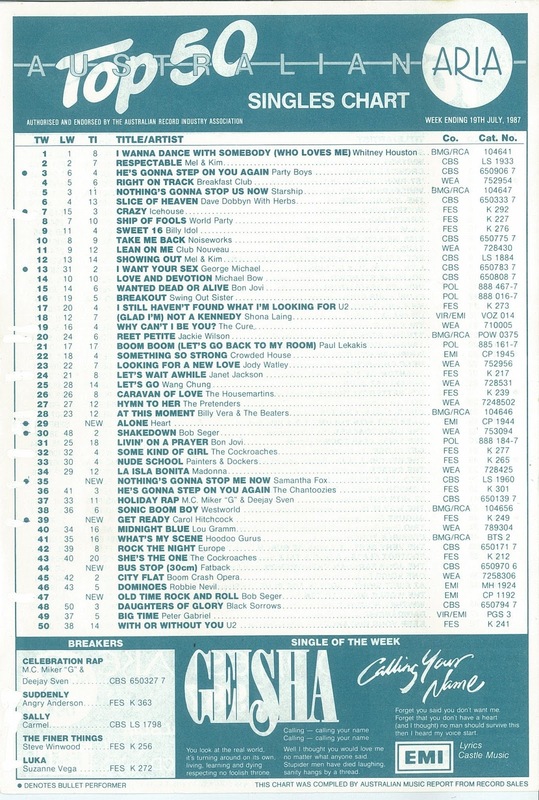 "Showing Out": "Australian Top 50 Singles Chart Week Ending 19th July, 1987". Imgur.com (original document published by ARIA). Retrieved 2 April 2016. 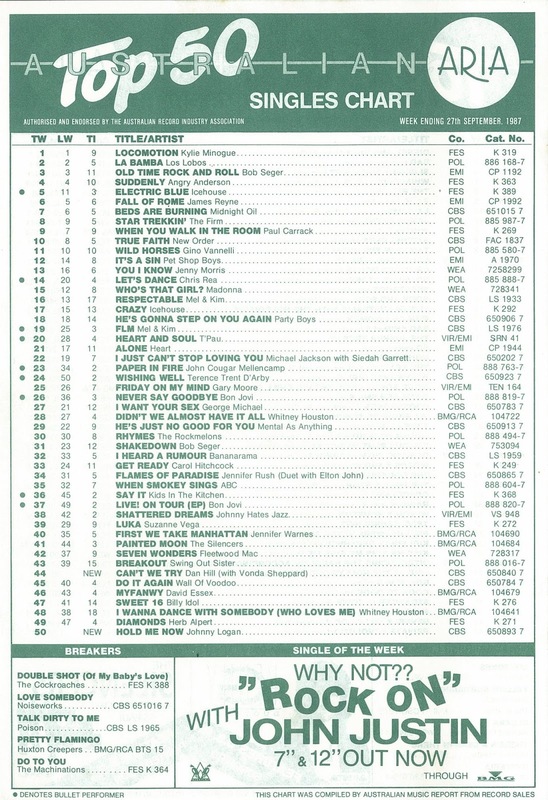 "Respectable": "Australian Top 50 Singles Chart Week Ending 26th July, 1987". Imgur.com (original document published by ARIA). Retrieved 2 April 2016. "F.L.M." (single): "Australian Top 50 Singles Chart Week Ending 27th September, 1987". Imgur.com (original document published by ARIA). Retrieved 2 April 2016. 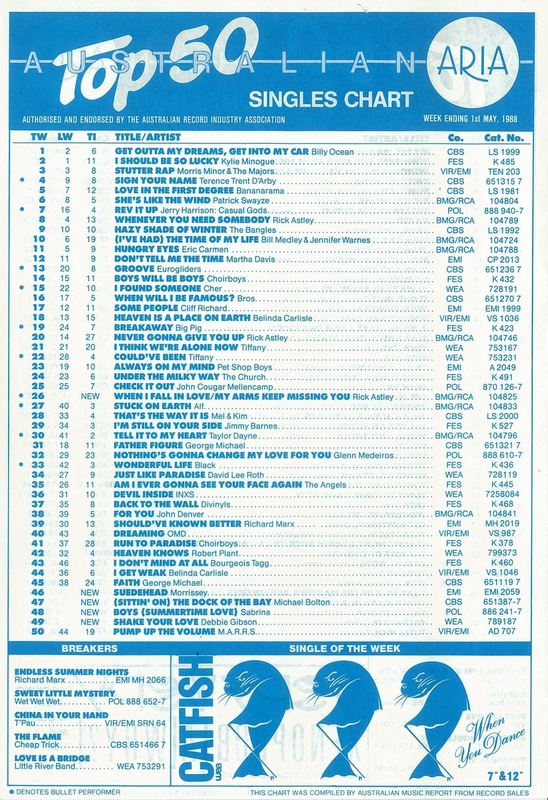 "That's the Way It Is": "Australian Top 50 Singles Chart Week Ending 1st May, 1988". Imgur.com (original document published by ARIA). Retrieved 2 April 2016. "Showing Out": "Offizielle Deutsche Charts > Mel & Kim – Showing Out (single)" (in German). GfK Entertainment. Retrieved 2 April 2016. "Respectable": "Offizielle Deutsche Charts > Mel & Kim – Respectable (single)" (in German). GfK Entertainment. Retrieved 2 April 2016. F.L.M. (album): "Offizielle Deutsche Charts > Mel & Kim – F.L.M. (album)" (in German). GfK Entertainment. Retrieved 2 April 2016. "F.L.M." (single): "Offizielle Deutsche Charts > Mel & Kim – F.L.M. (single)" (in German). GfK Entertainment. Retrieved 2 April 2016. "That's the Way It Is": "Offizielle Deutsche Charts > Mel & Kim – That's the Way It Is (single)" (in German). GfK Entertainment. Retrieved 2 April 2016. ^ "dutchcharts.nl > Mel & Kim – F.L.M." (in Dutch). Hung Medien. Retrieved 2 April 2016. ^ "norwegiancharts.com > Mel & Kim in Norwegian Charts". Hung Medien. Retrieved 2 April 2016. ^ a b "charts.org.nz > Mel & Kim in New Zealand Charts". Hung Medien. Retrieved 3 March 2019. ^ "swedishcharts.com > Mel & Kim in Swedish Charts". Hung Medien. Retrieved 2 April 2016. ^ "hitparade.ch > Mel & Kim – F.L.M." (in German). Hung Medien. Retrieved 2 April 2016. 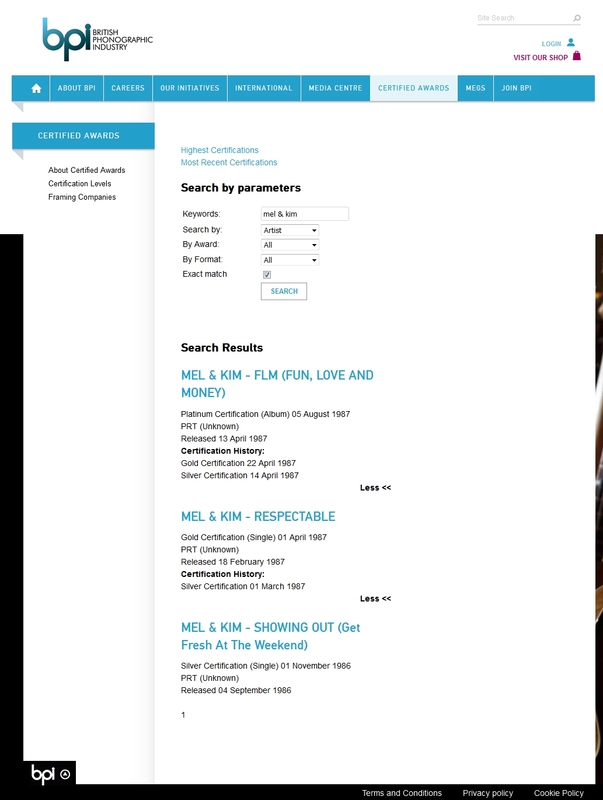 ^ a b c "BPI > Certified Awards > Search results for Mel & Kim (from bpi.co.uk)". British Phonographic Industry. Retrieved 2 April 2016. ^ "Ultratop > Zoeken naar: Mel & Kim" (in Dutch). Hung Medien. Retrieved 2 April 2016. ^ "lescharts.com > Mel & Kim Dans Les Charts Français" (in French). Hung Medien. Retrieved 2 April 2016. 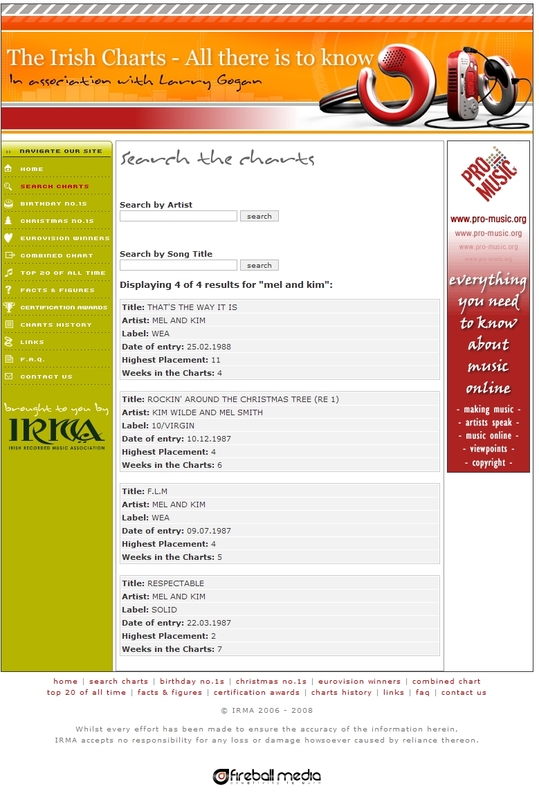 ^ "Screen shot of search results for 'Mel and Kim' from irishcharts.ie". Imgur.com (original source published by Fireball Media). Retrieved 25 November 2015. ^ "dutchcharts.nl > Zoeken naar: Mel & Kim" (in Dutch). Hung Medien. Retrieved 2 April 2016. ^ "hitparade.ch > Suche nach: Mel & Kim (songs)" (in German). Hung Medien. Retrieved 2 April 2016. ^ "Mel & Kim Chart History > Hot 100". Billboard. Retrieved 3 March 2019.